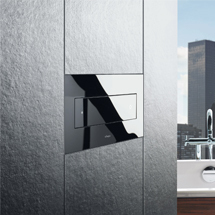 Form, function and quality without compromise, Viega brings the very best of German design and engineering to the contemporary bathroom with the Viega More and Viega Style Push Plates and Mono Slim Inwall Cisterns. Designed to inspire and engineered to impress, the Viega Concealed Cistern Collection introduces a world of premium German ingenuity into the modern bathroom. Hidden behind every push plate is the precision engineered Mono Slim Inwall Cistern, available for both wall hung and floor mount toilet pans.